​​​PLANO – Legacy West's tallest tower is underway bringing aspirational l​​​iving to the $3.2 billion mixed-use development. 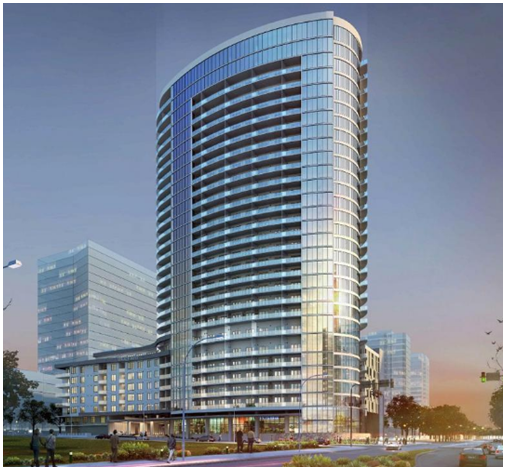 The 29-story tower will bring 328 luxury residences to Legacy West ranging from 600 sf to penthouse units with private garages totaling 3,800 sf of living space. LVL29 will sit at 6000 Columbus Ave. near Windrose Ave. adjacent to Boston-based Liberty Mutual Insurance's new regional hub. The residential community's amenities will include a 24-hour fitness center and a bar and lounge veranda for residents. The tower will also have an attached seven-story parking garage. Henderson Design Studio is the interior architect on the residential tower, which is slated for completion in May 2019. NE Development will begin leasing up the high-rise tower in December 2018.